>Some bands spawn multiple side projects when individual members decide to branch out, like, creatively, maaan. New Order, for example, fractured into not only Electronic, but also Revenge, Freebass – who had three bassists in the band – (three-bass, geddit? ), Monaco and The Other Two (who were, erm, the other two left in the band who hadn’t done a side project). The truely wonderful Art Brut on the other hand, have also spawned a number of side projects, though unusually, all of them seem to have emerged due to the wandering mind of affable frontman Eddie Argos. His blog lists eight bands that he is in – more than enough to create an Eddie Argos Side Project Week here on A New Band A Day, and believe me, such is my admiration for the unlikely Art Brut Lothario, that I seriously toyed with the idea. 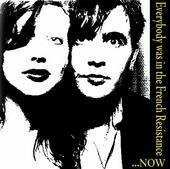 However, common sense prevailed, and Everybody Was In The French Resistance…Now alone are today’s new band. Their guiding principles are as entertaining as their tunes – they aim to “correct the mistakes of pop songs past”. Therefore, the super G.I.R.L.F.R.E.N (You Know I’ve Got A) on their MySpace page is a riposte to Avril Lavigne’s recent crud-bucket of a song of a similar name. It is such a happy idea – to take a song in which someone’s been wronged and call in the pop-airstrike to level things out – that it can’t help but work. Whether you regard this as a merely a slight joke or (hopefully) as good fun blended with yummy tunes, it doesn’t really matter. They don’t care what you think. They’re settling scores in the realms of pop, and your (least) favourite song might be next. Don’t forget, you can always contact me here at A.N.B.A.D. via email if you have any suggestions for bands you’d like to see featured! Posted on May 8, 2008 by Joe Sparrow. This entry was posted in Today's New Band and tagged art brut, REVENGE, wandering minds. Bookmark the permalink. King Antics; and Meaningless Achievements – Featuring A Guest Appearance From Eddie Argos! | A New Band A Day!